Consideration of Ancient Wisdom in the maintenance of robust health is more important than ever today with Media Medicine seemingly dominating the wellness conversation at every turn. Traditional cultures relied on a strong immune system rather than the crutch of antibiotics and other drugs to survive infections and epidemics. Passing this knowledge on from generation to generation was of critical importance. With so much of this wisdom having been lost since the Industrial Revolution, it is always exciting to me when a snippet of truth is rediscovered in ancient texts and other writings. One such text recently brought to my attention which contains such medicinal wisdom is The Book of Tobias, also known as the Book of Tobit. While not included in the shorter Hebrew Canon, The Book of Tobias is considered canonical by the Catholic, Russian and Greek Orthodox Churches. It is also included in The Apocrypha which comprises extra texts not part of the Old Testament canon but recognized of value by many Protestant faiths. Fragments of this text were recently discovered among the Dead Sea Scrolls in both Hebrew and Aramaic which has given the book additional credibility and attention. 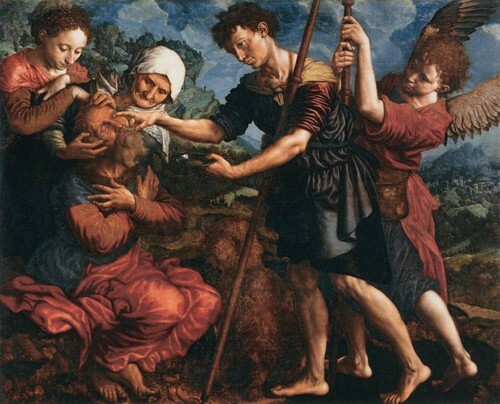 In this book, the virtuous young Tobias is assisted by the Archangel Raphael in bringing relief from suffering and happiness to Tobit, his blind Father as well as the tormented widow, Sara. Tobias restores his Father’s sight using medicines from the entrails of fish, including the heart, gall, and liver. This text is the earliest known reference to the use of fish innards as healing and sacred remedies. The traditional use of fish liver oils throughout history since that time harkens back to the wisdom of this ancient text. Of course, the fish liver oils used were not of an industrialized nature, meaning the oil was extracted quickly via use of high heat (400F). Rather, traditional practice in Roman and Viking times was to reserve the livers and let them ferment for a period of months until the oils were rendered naturally thereby preserving all delicate nutritional cofactors and healing elements. Beginning about 1850, this very slow, 6 month process of rendering fish liver oils which preserved all the nutrition began to gradually be abandoned in favor of high heat processing which rendered the oils in only a day. By 1920-1940 or so, all cod liver oil on the market was basically being rendered in a modern fashion. A resurgence of interest in the traditional manufacture of fish liver oil occurred after the turn of the millennium with the advent of Green Pasture Products’ fermented cod liver and skate liver oils. Hopefully, other companies will follow suit and abandon the modern method of processing fish oils. Clear + Colorless + Odorless + Flavorless is also Nutritionless as this indicates an industrialized manner of processing. Fish liver oil should taste fishy – not rancid – but fishy. If it doesn’t, there is limited to no nutritional value. The vast majority of fish and cod liver oils on the market today are processed by a handful of refiners. While the packaging and marketing varies from company to company, the fish oils are all basically the same – nutritionless and potentially even of negative health benefit due to the high temperature processing. Could it be that the huge focus on the omega 3 fatty acids, EPA and DHA, in fish and fish liver oils on the market today is because that is all that is left after the violent, industrialized processing? Fish oils processed in the traditional manner which takes months rather than hours have much much more to offer beyond omega 3 fats. Natural vitamins A, D, E, and K are all present at significant levels to heal, strengthen, and provide a firm foundation for the immune system. Moreover, vitamin D has over 3000 derivatives many of which are found in traditionally manufactured fish liver oils. Only the main vitamin D derivative is present in the industrialized fish liver oils and it is typically in synthetic form added after processing because the high heat used to render the oils destroys all the natural vitamin D! While we can learn and wonder about ancient remedies via early writings such as the Book of Tobias, it is equally important that the manufacturing of the remedy itself be in line with traditional production methods. Nowhere is this example more evident than a comparison between the rendering of fish oils by the Vikings and Romans as compared with modern day, industrialized cod liver and fish oils. To be considered a truly traditional and sacred remedy, both the remedy itself and the method of producing it must follow traditional principles.